Dracaena draco, the Dragon Tree, is from the Canary Islands. Only a few individuals can be found growing naturally, and these are mainly on the islands of Tenerife and La Palma, growing in dry bush at the low elevations of the islands' rocky mountain ranges. 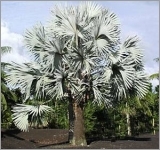 It's a Palm-like tree when young, evergreen, slowly growing to 10-30 feet tall. The plant is related to Agave, and looks like one when young. At this stage, it's used as a houseplant. It slowly develops a thick trunk, making it look more like a Palm. 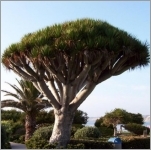 The Dragon trees tend to stay unbranched for many years before expanding as a tree. It is the flowering that causes the stem to branch. Flowering may take 10-15 years to begin, after which the tree begins to branch, creating the much-divided crown so characteristic of specimens several decades old. The bark is initially smooth and gray, becoming scaly. The leaves are stiff but flexible, numerous at the ends of the very stout branches, 2 feet long and 1 1/2 inches wide, sharp pointed tip and gray-green. The hundreds of small, fragrant, creamy-white, bell-shaped flowers are borne in branched spike in early Summer. The flowers are followed by orange berries. The fruits are pea-sized, and very fleshy. It has a sap that hardens to a dark red. People call the sap Dragon's Blood. The sap is sometimes used as a fake stone in jewelry.